Welcome back, Ready Nutrition Readers, and we’re going to jump into Part 2 of the Introduction to Trauma Medicine series. Firstly, we’ll address the concerns of one comment that was posted. What we’re planning on doing with this segment is a continuation of part 1 . The reason that specific examples have not been selected is because we will cover each trauma scenario individually with what you will see in: A. Natural Disaster/Emergency trauma, and B. Grid-Down, Road Warrior Apocalyptic SHTF trauma. We thank you for your comments, as we do read them and they matter to us. These first two introductory articles are just that: a basic overview for a readership that may or may not have experience with tube thoracostomy or needle pericardiocentisis. We’re covering “sticks and rags,” as Mr. R.V. Johnson (one of my instructors) termed “Bandaging and Splinting” in the 18-D Course (Special Forces Medical Sergeant’s Course). We’re introducing the basics for your understanding of trauma medicine, and we’ll follow up with individual articles to cover specific types of trauma, as each needs its own article. If you’re far beyond the basics, then relax and treat it as a refresher, and my apologies for boring you. Now that everything has been explained, let’s get on with it. Now everyone wants to know about equipment. I repeat from the earlier article, the first thing you need: a definitive course or courses of basic study to know about human anatomy and basic first aid. There are plenty of sites with lists of equipment; however, here is a basic (non-exhaustive) list of things you may wish to acquire. *Complete Minor Surgical Wound Kit: a good one (military issue) will include tweezers, bullet probes, exam light, suturing forceps, handle for scalpel blades and the blades (assorted types), suturing material with “driver”/curved suturing needle attached (you need silk and chromic gut), small scissors, alcohol and betadine prep pads. A good one nowadays will run you at least $50.00 and they pay for themselves the first time you need them. **Four (4) bags of fluid minimum, means (2) 1000 ml bags Ringer’s Lactate, and (2) 1000 ml bags 0.9% Sodium Chloride solution. The former is for pure fluid replacement, the latter for pushing meds with a secondary function of fluid replacement, as it is an isotonic solution. ***These mesh wire cages can be 6-8” in width and about 12-18” in length. Their functions are: 1. To build a wire support ring/cage to stabilize and treat an impaled object, and 2. To cover over for additional flexible splints, if needed. NSAIDS (Non Steroidal Anti Inflammatory Drugs): Aspirin (pain and fever reduction), Tylenol (Acetaminophen) for pain and fever, Motrin (Ibuprofen) for pain and swelling (edema). Diphenhydramine HCL (Benadryl): an antihistimine that is also effective in low dosages as a sedative/sleep aid; excellent for allergic reactions, especially of the skin. Multivitamins: Yes, that’s right! Multivitamins are really good to give to a patient that is already struggling to process food and recover from an injury. These lists are just for starters and you can add to them as you feel the need. 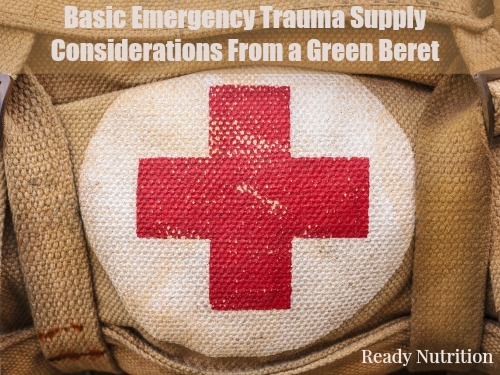 Dr. Bones and Nurse Amy or DoomandBloom.net  have a complete trauma kit  that would be a great beggining to your SHTF medical supplies. Using the list provided above, you can add any remaining medical supplies to this pre-made kit. Remember to familiarize yourself with the function of each and every piece of equipment you have. Many of these articles you may or may not be able to legally have in your possession depending on where you reside! Follow all existing laws and if you have any questions about whether a piece of equipment or a medication is legal to have, contact a lawyer prior to purchasing either. Let’s talk about those meds, by the way. Most of those mentioned can only be obtained with a prescription. It is a fact that unless specifically stated otherwise, veterinary meds are as good quality wise to their human equivalents. Usually they may read, “Not for human consumption,” or something similar. Such is their disclaimer. That being said, you may wish to consult a veterinary supply store for any of those mentioned…for your pets, of course. As mentioned before, all of this information is for informational purposes only and is not intended to diagnose, treat, or prescribe any action or activity mentioned within this article. Ready Nutrition’s writers and staff are not recommending any course of action for conditions or activities outlined in this article. These are some of the basics you’ll need for an aid bag for your family/team. We outlined some of the categories of medical training that you will need to cover to well round your abilities. The next article will present an overview of different trauma scenarios you will see (emergency and apocalyptic/end of McDonald’s times) that will explain each in general. We will then take each of these individually and present them to you in parts: detailed information of each traumatic scenario/challenge, what you’ll need with equipment and meds to deal with it, and how to train to treat such things.